// Explicitly fill in the IRP handlers we want to hook. // Hook the keyboard now. // Create a keyboard device object. // Make sure the device was created. // Get the pointer to the device extension. // Set the worker thread to running state in device extension. // Create the worker thread. // Obtain a pointer to the thread object. // We don't need the thread handle. // Initialize the lock for the linked list queue. // Initialize the work queue semaphore. // Create the log file. // Set the DriverUnload procedure. // for the driver below us. // Set the completion callback. // Track the # of pending IRPs. // Pass the IRP on down to \the driver underneath us. // Get the device extension - we'll need to use it later. // If the request has completed, extract the value of the key. // Fill in kData structure with info from IRP. // can write it out to a file. // Increment the semaphore by 1 - no WaitForXXX after this call. // Mark the IRP pending if necessary. // Wait for data to become available in the queue. // Convert the scan code to a key code. // before writing it to the file. // Write the data out to a file. // Detach from the device underneath that we're hooked to. // Set our key logger worker thread to terminate. // Wake up the thread if its blocked & WaitForXXX after this call. // Wait until the worker thread terminates. // Close the log file. The following figure illustrates the driver stacks for PS/2 keyboard and mouse devices, and serial mouse devices. Vendor drivers for PS/2 and serial keyboard and mouse devices are not required. 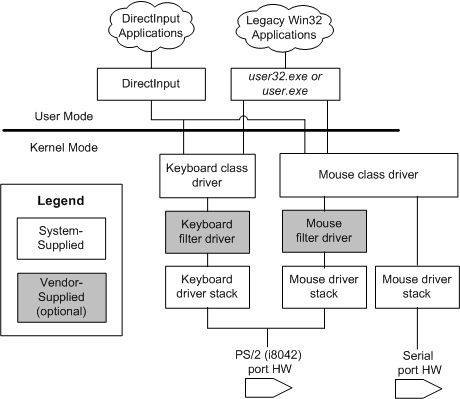 Vendors can supply a filter driver for a PS/2 keyboard and mouse — see Features of the Kbfiltr and Moufiltr Drivers. The KbFilter_ServiceCallback routine is a template for a filter service callback routine that supplements the operation of KeyboardClassServiceCallback. Pointer to the first keyboard input data packet in the input data buffer of the port device. Pointer to the keyboard input data packet that immediately follows the last data packet in the input data buffer of the port device. Pointer to the number of keyboard input data packets that are transferred by the routine. Declared in kbfiltr.h. Include kbfiltr.h. The ISR dispatch completion routine of the function driver calls KbFilter_ServiceCallback, which then calls KeyboardClassServiceCallback. A vendor can implement a filter service callback to modify the input data that is transferred from the device's input buffer to the class data queue. For example, the callback can delete, transform, or insert data. For more information about customizing the keyboard class service callback, see Connect a Class Service Callback and a Filter Service Callback to a Device. KbFilter_ServiceCallback runs in kernel mode at IRQL DISPATCH_LEVEL. KEYBOARD_INPUT_DATA contains one packet of keyboard input data. Specifies the unit number of a keyboard device. A keyboard device name has the format \Device\KeyboardPortN, where the suffix N is the unit number of the device. For example, a device, whose name is \Device\KeyboardPort0, has a unit number of zero, and a device, whose name is \Device\KeyboardPort1, has a unit number of one. Specifies the scan code associated with a key press. Specifies a bitwise OR of one or more of the following flags that indicate whether a key was pressed or released, and other miscellaneous information. KEY_MAKE The key was pressed. KEY_BREAK The key was released. KEY_E0 Extended scan code used to indicate special keyboard functions. See the Kbdclass sample code. KEY_E1 Extended scan code used to indicate special keyboard functions. See the Kbdclass sample code. Reserved for operating system use. Specifies device-specific information associated with a keyboard event. Declared in ntddkbd.h. Include ntddkbd.h. In response to an IRP_MJ_READ (Kbdclass) request, Kbdclass transfers zero or more KEYBOARD_INPUT_DATA structures from its internal data queue to the Win32 subsystem buffer.